One of the most powerful features of Processing in comparison to all web-based approaches and frameworks (like p5.js) is the ability to export your sketches to any format you can imagine. Processing does not provide all of these options out of the box, but there are excellent libraries for any use case. Since i use instagram to distribute my work, i’ve developed an optimized, slick workflow to export videos and i wanna share it with you today. There are multiple ways to export a video from your sketch in Processing and i’ve tried them all. The most easy and intuitive one is utilizing a Processing-library called Video Export by Abe Pazos. 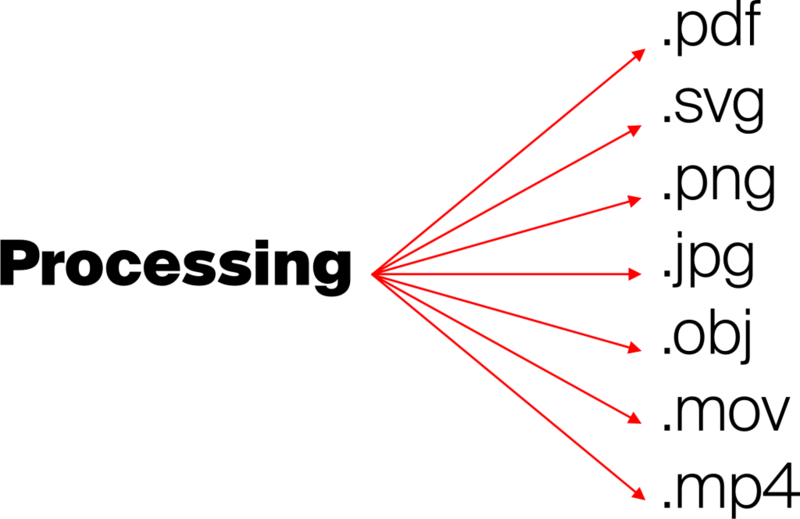 Before we can use that library in Processing, we have to install something called “FFMPEG” on our computer, which is a powerful software for video-conversion that can be used via the command-line. It is made for programmers and programmers install things a bit differently than “normal” people. Please do me little favor and promise that you won’t stop working through this tutorial from now. The things we’ll do together in the next steps may look a bit overwhelming for you, but they are simply required. In the end you’ll don’t have to worry about them anymore. Let’s take a deep breath and get going. 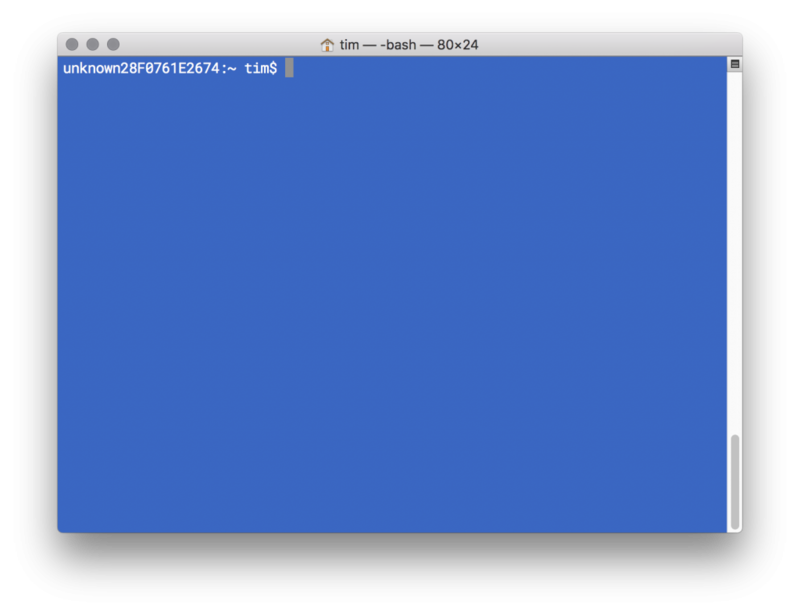 The Terminal is an utility-application of MacOSX that enables us to install the software we need. It can be found in the applications-folder inside “utilities”. The script will install “HomeBrew”, which is a so called “package manager”. It enables us to install software via the Terminal easily. If you are logged in as an admin, the script will ask you for your password. If you are not logged in as an admin in MacOSX, you’ll have to write the command above with a “sudo” in front. Put it in there and hit enter. The script will run a few seconds. Take the time to cook some tea or coffee. Again: If you’re not logged in as an admin, you’ll have to put the “sudo” command in front and then type your username and your password. Hopefully everything works fine and we can go to the next section to install the actual library. I don’t have a windows-machine and i can’t give you profound advices about installing the required tools on your computer. Sorry! If you know how to do it properly on Windows, then please drop me a line and tell me a bit about the installation process of FFMPEG. I would love to address all the people out there using any OS. In Processing, go to the menu “sketch > import Library > Add Library”. The so called “contribution-manager” will open up. Click “Video Export” and then click “Install”. That’s it! 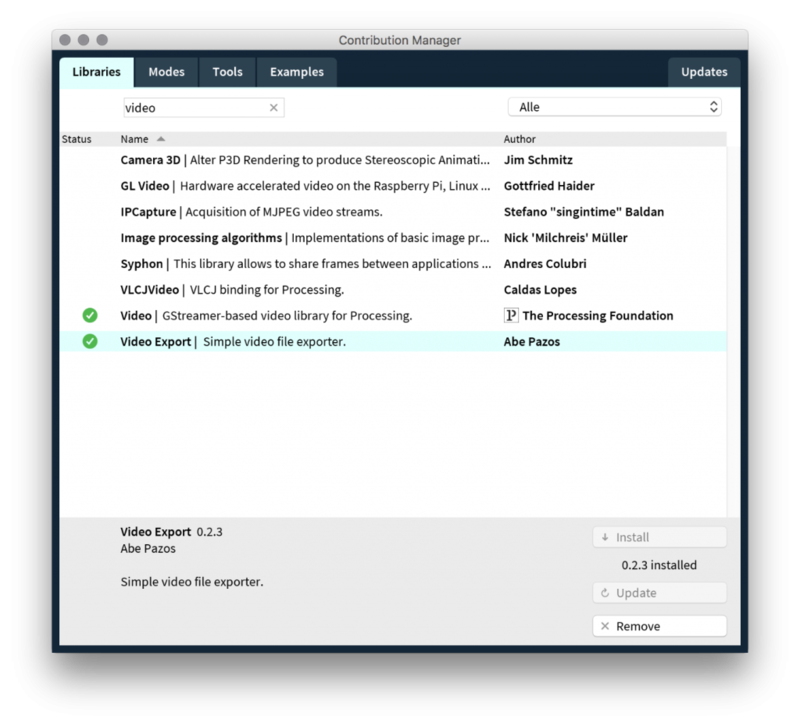 Now you are ready to use the VideoExport-library in Processing. All you have to do is adding a few required extra-lines of code to your sketches. Now get creative and make something awesome!